"Paul Regan "The Organizer" is among those who can help seniors figure out what should be thrown out, given away, or put on commission with an antiques appraiser." "We spent 5 days with Paul, who was delightful and of great assistance to us when we moved to our new home." 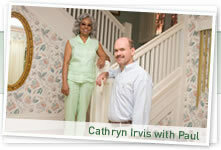 "Paul has assisted Longwood at Oakmont residents since 1993. He's an experienced professional who tailors his work to the needs of his clients. Paul calmly and compassionately works with clients to separate their "must-haves" from their "don't needs." When it comes to organizing and moving knowledge, Paul is the pearl in the oyster." "I chose Paul Regan when it was time for me to downsize from a three-bedroom house to a two-bedroom apartment -- a house that had been storage for memorabilia from as far back as high school, college, and my husband's navy career. It was a very large undertaking, but Paul put me at ease immediately. I trusted him to deliver, and he did. He picked up on my personality and my needs and fit himself into my life so that I was entirely comfortable through the move and achieved what I had envisioned - an apartment that is beautiful, a place to call my own." "Paul realizes that he is handling items that have a lifetime of importance. He treats clients and their belongings with a great deal of sensitivity." "Paul does so much more than organize! I expected great efficiency as we worked with Paul to move my father-in-law to a retirement community. However, it was his sensitivity and insight in helping us choose just the right things – from furniture to photos to knickknacks – that I appreciated most. Now that we are working to sell the house, Paul continues to be a great resource with suggestions and contacts. Knowing I can call on Paul whenever things get too overwhelming is a lifeline in this process." "Paul is the single point of contact for all of a client's needs...he understands the move can be extremely stressful and gives his personal attention."